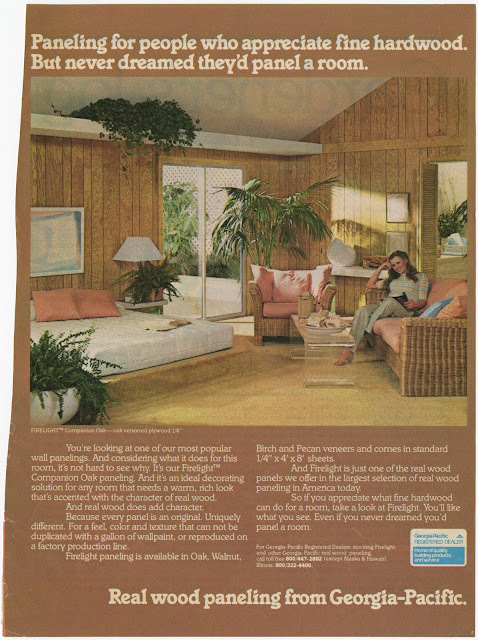 "Paneling for people who appreciate fine hardwood. But never dreamed they'd panel a room. You're looking at one of our most popular wall panelings. And considering what it does for this room, it's not hard to see why. It's our Firelight Companion Oak paneling. And it's an ideal decorating solution for any room that needs a warm, rich look that's accented with the character of real wood. And real wood does add character. Because every panel is an original. Uniquely different. For a feel, color and texture that can not be duplicated with a gallon of wallpaint, or reproduced on a factory production line. Firelight paneling is available in Oak, Walnut, Birch and Pecan veneers and comes in standard 1/4"x4'x8' sheets. And Firelight is just one of the real wood panels we offere in the largest selection of real wood paneling in America today. So if you appreciate what fine hardwood can do for a room, take a look at Firelight. You'll like what you see. Even if you never dreamed you'd panel a room."